Pregabalin has demonstrated efficacy for the treatment of neuropathic conditions such as diabetic neuropathy and trigeminal neuralgia. It is commonly prescribed for radicular back pain; its utility for this condition is controversial. There is no data to support the use of pregabalin (Lyrica) for acute radicular low back pain. Pregabalin may be beneficial for chronic radiculopathy, particularly for patients who have not had an adequate response from the use of nonsteroidal antiinflammatory agents (NSAIDs) or opiates. Pregabalin may have a synergistic effect when prescribed in combination with NSAIDs or opiates. Pregabalin is commonly prescribed for neuropathic conditions, and there is literature to support its efficacy for postherpetic neuralgia and diabetic neuropathy. This drug is also being used off-label with frequency for the treatment of radicular back pain. What does the data say regarding its use for this condition? Pregabalin binds to the alpha2 delta subunit of the voltage-gated calcium channels. It inhibits neurotransmitter release. Pregabalin stops the neuron from firing, which is why it works well in neuropathic pain. Pathophysiology of radicular back pain. In conditions such as postherpetic neuralgia and diabetic neuropathy, pain is caused by the irritation of or inflammation around the nerve. In contrast, lumbar radiculopathy is caused by damage and/or inflammation to the nerve itself. 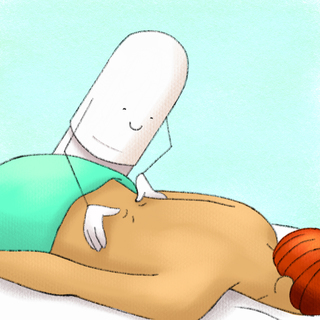 There is a paucity of literature evaluating the efficacy of pregabalin for radicular back pain; only one randomized controlled trial has been published. Most of the other papers refer back to this study. This study was a placebo-controlled withdrawal trial. This means that those who were initially determined to be placebo responders were excluded from the study so that the final results were more precise for the drug being studied. All patients with radicular back pain who were enrolled in the study were given placebo. Those who responded to placebo were removed from the study. All of the placebo non-responders moved on to receive pregabalin for 4 weeks. Those who did not respond to pregabalin were removed from the study. All of the pregabalin responders were then randomized to either continue pregabalin treatment or to receive placebo for 4 weeks. Those who were taking second-line treatments for pain. Those taking a high-potency opioid. Unfortunately, this type of opioid was not clearly defined by the authors. The primary endpoint was the loss of response from the placebo group in the placebo versus pregabalin part of the study. During the single arm of the treatment phase, where all the patients were given pregabalin, about 60% had a reduction in their pain scores. Once patients were randomized to receive either placebo or pregabalin, there was no significant difference in terms of the pain scores. There was no loss of response, and the primary endpoint was not statistically significant. Other studies have shown some benefit of pregabalin in radicular back pain. Two evaluated the efficacy of pregabalin in combination with either an NSAID or an opioid. They found that combination therapy (with either an NSAID or an opioid) reduced pain better than either medication on its own. This synergistic effect makes sense given the pathophysiology of radicular back pain which is believed to have both inflammatory and neuropathic components. Pregabalin has been studied to look at its use in perioperative patients. They found that pregabalin could delay the need for spinal surgery in patients with severe spinal stenosis. It also seemed to improve pain scores postoperatively in patients started on pregabalin prior to discectomy. A study out of Spain found that giving pregabalin to patients with chronic radicular back pain reduced health care costs and personal costs due to time off work. All of the above mentioned studies were done on patients with chronic radicular back pain. Only two were randomized controlled trials (RCTs), and the RCTs had very few patients (less than 40). The rest of the studies were open-label prospective trials that were industry-funded or retrospective reviews. There were 2-3 negative studies which didn’t show a significant effect of pregabalin for radicular back pain. Pregabalin, like all drugs, has the potential for side effects. Dizziness and somnolence are two of the most commonly reported adverse effects. What is the bottom line regarding the use of pregabalin for radicular back pain? There is no literature to support its use for patients with acute radiculopathy. Given the high rate of spontaneous resolution of acute back pain and the possible adverse effects of pregabalin, this drug should not be prescribed for patients on their initial presentation. For patients with chronic radicular pain, pregabalin is probably efficacious, although the evidence is conflicting. It is a good option for patients already taking NSAIDs or opioids, since it may have a synergistic effect. It may actually reduce the amount of NSAIDs and opioids that the patient requires. Believe there is a Dothiepin mini 3mg at night . Combination short acting NSAID -PPI in moderate-severe patients NSAID night Paracetamol morning ? Any trials ? Greetings, happy to discuss this further but just had a few questions with regards to your question. Are you asking what is the evidence for pregabalin versus naprosyn/PPI or naprosyn/paracetamol in radicular back pain? With regards to the trials, do you mean trials regarding pregabalin or for non-pregablian therapies?